Orthodontics deals with the prevention and treatment of malocclusion in children, adolescents and adults. Curves or incorrectly arranged teeth are not only a serious aesthetic problem. The task of orthodontics is to restore the proper position of the teeth in the dental arch, as well as to restore the correct bite of the jaw with the mandible. In our clinics, we will cure any malocclusion. The basic form of treatment of malocclusion is the orthodontic appliance. It is worth remembering that teeth with incorrect alignment are often the cause of serious health problems: they are more susceptible to the development of caries, more difficult to clean, and therefore may contribute to the development of gum disease and periodontitis (periodontitis). They can also cause the dysfunction of the masseter muscle and temporomandibular joints. There are no age restrictions in orthodontic treatment. Depending on the patient’s age, we choose mobile (removable) or fixed. Mobile devices are perfect for orthodontic treatment of children with milky or mixed teeth. We use fixed braces when the skeletal system is fully developed. During the consultation visit we answer questions bothering you about orthodontic treatment, we will suggest possible methods of treatment and orthodontic appliances and we will present an initial treatment plan. The method of treatment of malocclusion is selected for individual needs of each patient based on the analysis of cephalometric and OPG and diagnostic models (jaw impressions). The benefits of orthodontic treatment affect, among other things, the improvement of oral health and, in general, our appearance. The requirement to start such treatment is healthy or cured teeth. A graduate of the Medical Academy in Wroclaw. A member of the Polish Orthodontic Society, participant of numerous courses in the field of orthodontics in the country and worldwide. Author of a numerous publications in specialist journals (including Orthodontics in Practice). Master of Science in Orthodontics at the University of Krems, Austria. 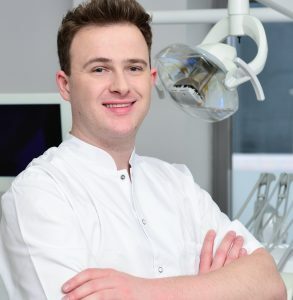 At Luxdentic, he deals with comprehensive orthodontic treatment of adults and children, using the latest treatment techniques in his work. He takes care of the smiles of his patients with the utmost diligence and devotion, making the demanding orthodontic treatment satisfactory and pleasant for both parties.